How to motivating employees is one of the key questions that many organisations struggle with. I have developed a list of 10 best practises for motivating employees. Read it through carefully and simply start where you find your quick fix. Very few companies master the whole list. Motivation starts at the top. People always look up for direction. Make sure that management has got the same prioritises. It is crucial that management are sending the same messages to the organisation. How do you find out the managements priorities? Here are some useful questions that you can use when talking to top management. * What keeps you up at night? * What do our competition say when they talk about us? * If you could change one thing, what would be on the top of your list? Visualise your goals or vision in an image. A physical image. In this way everybody will have the same reference. Use the image frequently in your communication. When you are starting to get tired of it – it is just barely starting to get through, perseverance is a key word. * Understand their communication need. * Use qualitative measurement (interviews or focus groups) to find out what really ticks. * Use quantitative measurements (surveys) to get statistics as a basis for decisions. * Employees want to be seen and to feel important. Satisfy that need. * Make sure that your message meets both the senders and receivers needs. * Look for mental hooks. A mental hook is basically a need with your target group that you can use to formulate your message. Its kind of the “what’s in it for me”. * Your messages fit into a three-tier system as shown in the image below. 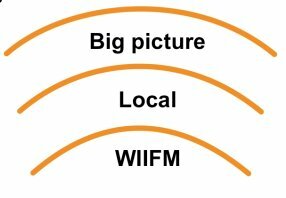 Big picture level, Local level and WIIFM (What’s In It For Me) level. * The big picture level is as it sounds, the big picture. It is the sum of all messages, and it’s the kind of messages that are long term, they don’t change often. * Local level messages are the big picture messages broken down to local sense. It is the parts that make up the big picture. These kinds of messages are shorter in time and can change more often. * And of course the WIIFM messages are the ones that impacts people’s lives. These are the kind of messages that you need to deliver personally. * When motivating employees you need to make sure that there are clear links between the messages in the Three-tier model. When you send a big picture message, you need to explain how that will affect the team or group or it will just create more questions than answers. * You also need to consider the sender credibility in the Three-tier model. Typically a big picture message needs to be sent by the top manager and the WIIFM message by nearest manager. 6. Use the right channel. * Different channels are good for different types of messages. Make sure that you use the right channel for your message if you want to motivating employees. The image below gives you a hint of what type of channel to use. * Often a mix of channels is the best solution when motivating employees. Two major reasons: Repetition is the mother of understanding. And also, people are different, and we prefer different channels. 7. Listen in the organisation. * This is where I would like to introduce the 540° communication concept: Inform, Listen and Confirm. 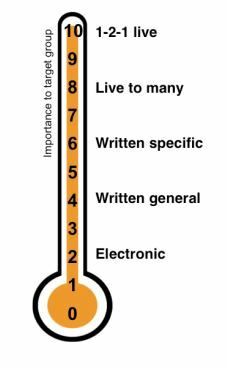 540° communication is a process where you involve people in translating big picture messages into local consequences and activities and then you feed back best practice to the organisation. More info on 540° communication?. * Managers often complain that they would like to communicate more, but they don’t have the time. When somebody says that to me, I really hear: I don’t know how, help! * I think we all agree on that motivating employees is the managers main responsibility. So, how can you help? If you work at the communication department, there are a lot of things that you can, and should do. Communication training, communication tools, communication standards, support and coaching. If you are a manager, ask the communication department for help. You shouldn’t really need to invent the wheel every time you are communicating. Believe me there are excellent standards available. * Listen to your target group. Did your communication activities work, what parts was good and what could be better. You should learn from your own mistakes. And also: steel with pride. This might sound strange. But really, everybody does it. It is called best practise. When you see a good communication exercise, make it your own and use it. Share your best ideas with colleges. Pay forward; it will come back to you. * When you send out information to your target groups, ask for feedback. Be precise: What was good, what could be better, Have you read and did you understood and also, did the information lead to any action? Not only do you improve your communication, this is also a very good way of motivating employees. * The Ambassadors are your informal leaders. They are already committed and people listen to them. When dealing with changes in the organisation, you want to use your Ambassadors in the process. So if you find out how many you have and perhaps also who they are, your life gets so much easier. At the same time you will find out how many Observers, Loose cannons and Weak Links (Checked out).